Unlike non-woven fabrics that are created directly from fibers, woven materials are made from threads created from the fibers. Apart from the every day items such as clothing there are many more applications for woven materials. They are used for supporting non-woven filters and special separation and filtration processes. 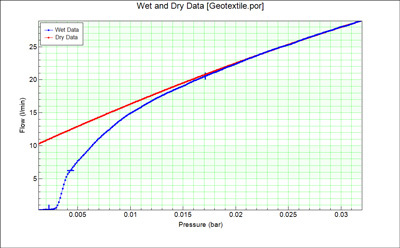 Wovens are made from very different m er thread filters are used to create special function “mesh-like” materials and many geotextile materials are made with woven polymer strands. 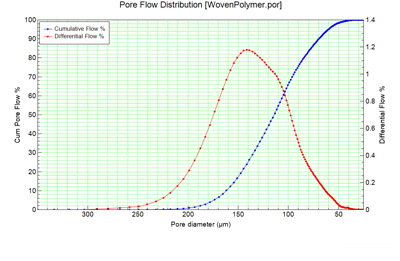 This pore size data is for a complex weave of polypropylene fiber. 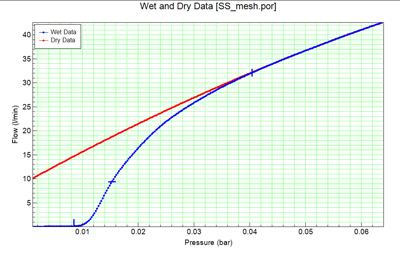 Woven stainless steel mesh is used for many applications including supports and pre-filters. The smaller pore size mesh materials are also used for specialist filtration products such as aviation and hydraulic filters. The pore size and permeability of these materials may easily be measured with the Quantachrome Porometer 3G. Non-woven materials are used in single use applications such as surgical masks, isolation gowns, caps, drapes and covers, scrub suits and medical packaging. Many of these items are made using some recycled materials to help offset the disposable nature of these items. Medical photo here!? 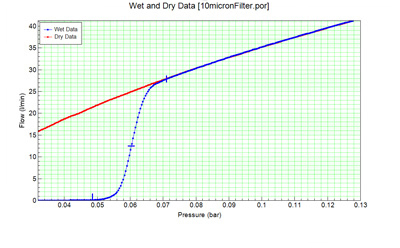 Filtration is the separation of solids from fluids (liquids or gases). 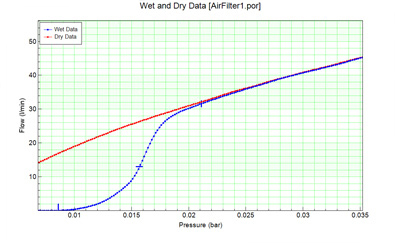 Typically, a porous structure (filter) allows fluid to pass while capturing particles that are too large too pass. Filters are made from many different materials and with many different properties according to application. The Quantachrome Porometer 3G series is perfect for measuring the through-pore size and the permeability of filtration media and finished products in many cases. The Filtration Industry relies upon quality testing to ensure that consistent products are always provided. Filters are made for a very wide variety of purpose. 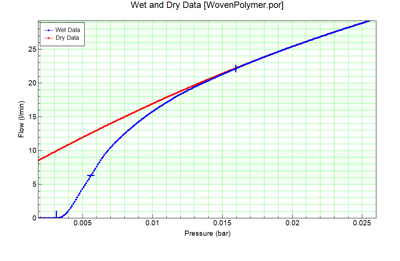 Most finished filtration products are started from some form of sheet non-woven fabric. One commonly known range of air filters is known by the “HEPA” definition. This definition according to the US Department of Energy means that they remove at least 99.97% airborne particles of 0.3 µm. HEPA filters are usually made with fibers; the fiber size and space between the fibers does not give the with particle retention size. Common household applications such as vacuum bags Allergen membranes or laminates with non woven layers. Typically, air filters need to pass a lot of air with minimum pressure drop, yet have to remove quite small particles. Unlike for liquid filtration, for air filtration quite small particles are retained on the fibrous structure and held by electrostatic forces. Although this sample that has a mean flow pore size of approximately 40 µm it is capable of removing particles much smaller than this. Liquid filtration applications include fuel, oil, and water, pharmaceutical and mineral processing filters. They may be of the liquid cartridge or bag filter types. 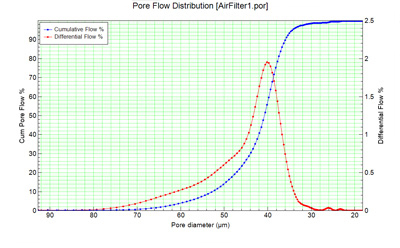 There is a huge range of liquid filters with pores sizes and structure according to purpose. 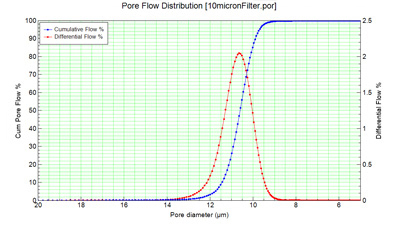 Their pore size ranges from several microns to just a few nanometers diameter. 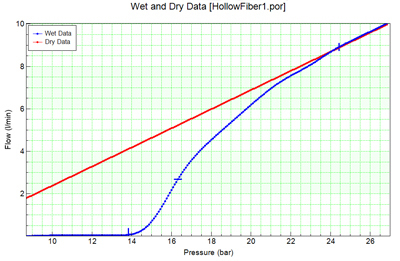 This first example is for a 10 µm polycarbonate filter that requires low pressures to measure. 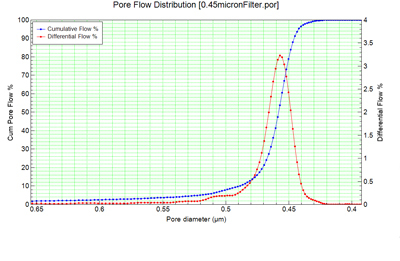 This 0.45 µm rated membrane filter required approximately 1.5 bar (21.8 psi) to be able to produce pore size distribution data. 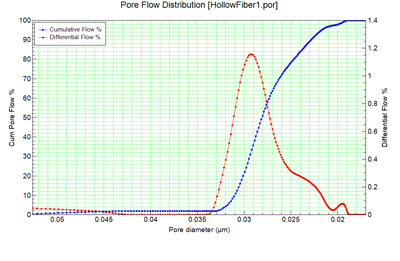 This pore size measurement is for a hollow fiber sample used for a water filtration application. 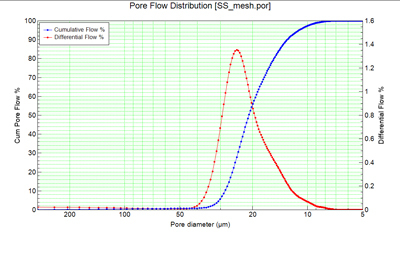 The higher pressures indicate smaller pores. 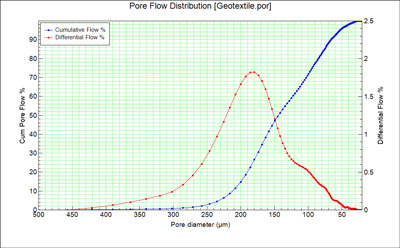 In this case the mean flow pore size is approximately 28 nm.